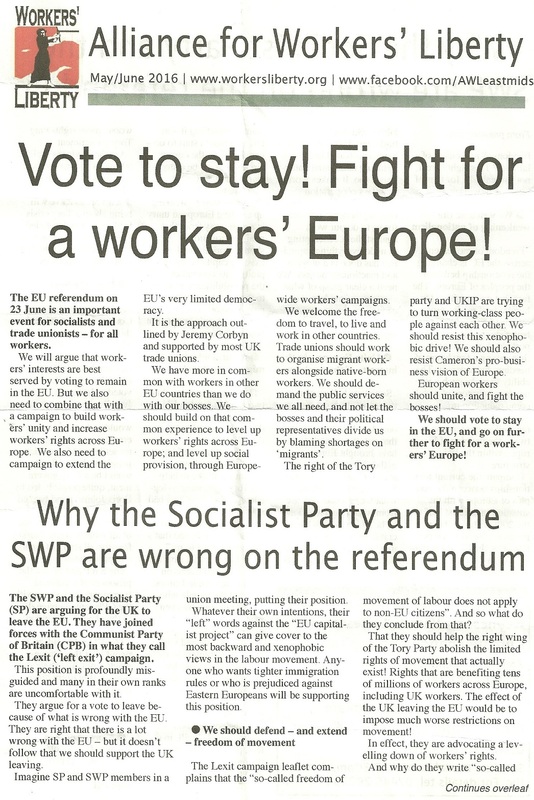 A leaflet from The Alliance For Workers’ Liberty urging a vote to remain in the EU in the UKs Brexit Referendum. From the 1994 European Elections a leaflet from Irishwoman Anne Murphy who was running for the Communist Party of Great Britain in London North West. 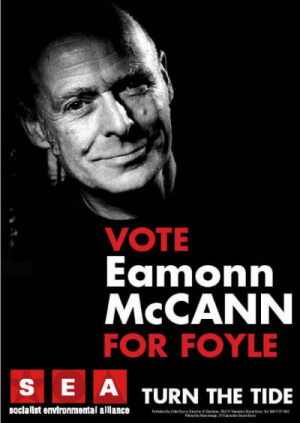 From the 2005 Westminster Elections The Manifesto for the Socialist Environmental Alliance candidate Eamon McCann running in Foyle. Veteran Campaigner McCann polled 1,649 votes. 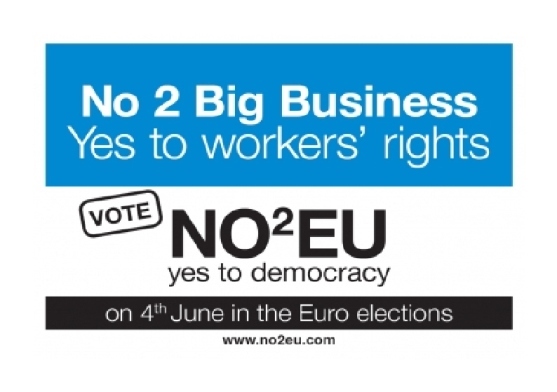 From the 2009 European Elections in the UK a flyer from the “NO2EU Yes to Democracy” grouping. No2EU – Yes to Democracy is a left-wing electoral alliance which was initiated by the National Union of Rail, Maritime and Transport Workers (RMT). The Alliance also included The Socialist Party, The Communist Party of Britain, Solidarity , The Alliance for Green Socialism, The Liberal Party, Socialist Resistance and The Indian Workers’ Association. The Alliance failed to win a seat. A press release from the group. From the 2010 UK Election, the standard leaflet from DUP Leader Peter Robinson. Peter Robinson sensationally lost his seat to Naomi Long of the Alliance Party. He is here pictured with Obama, with British soldiers serving in the Middle East, in the House of Commons but most strikingly hes pictured hard hat on a building site. If one didn’t know better you’d think he it was with a group of smiling developers. The Picture beside it is in my view foolish also as it pictures him beside a £ sign! In fact that page has him in the House of commons first, then with developers and then beside the pound sign. Underneath we have the arrow! From the 2010 UK Election in North Antrim, a leaflet from Independent Unionist Lyle Cubitt. Lyle wants the Assembly dropped and accuses Jim Allisters TUV and the Ian Paisleys DUP of telling lies to the Northern Electorate. Another unusual one from the UK Election. This time Celebrities endorsing the Labour Party. Eddie Izzard, Alex Ferguson, JK Rowling, Patrick Stewart, Tony Robinson, Liz Dawn and Ross Kemp are among those promoting Labour here. We may have the odd celebrity candidate in Ireland, but I’ve never seen an Irish political party produce something with a host of famous names endorsing it. Maybe its Irish begrudgery….. ‘Well if Bono says vote for **** , he can f*** o** if he thinks I’m listening to him’ and so on.